Harvest; the gathering of crops. Isn’t Fall symbolic of gathering family and friends and celebrating Thanksgiving and sitting around bonfires? Or maybe that’s just how I see it, but I feel that fall is the beginning of my favorite time of the year that encompasses a lot of “gathering.” What do you think of when you think of the word Harvest? Either way, fall indicates that a few holidays are just around the corner. What better way to kick off the season than a fun budget friendly table setting with goodies from the Target dollar spot. I’ve also teamed up with a group of great bloggers to share with you a fall festival blog tour. I’ve linked their beautiful fall tours at the bottom! 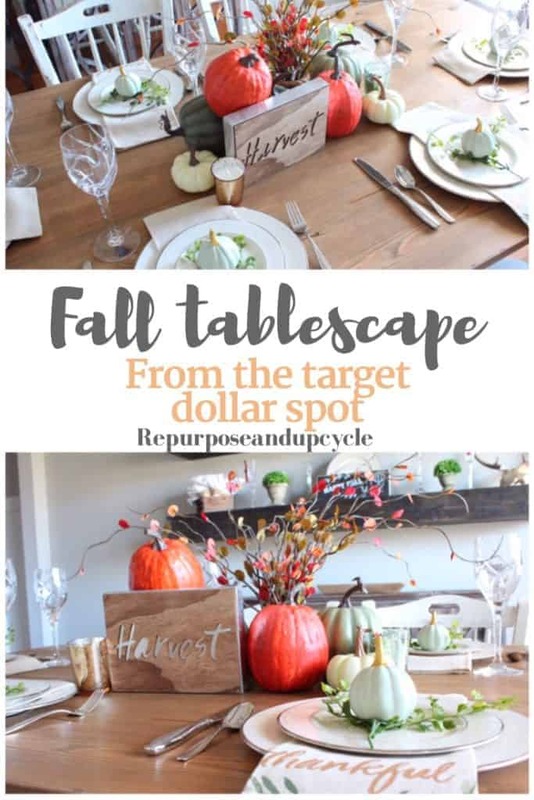 How about spending a little money on items like decor and creating a great and budget friendly fall table scape? 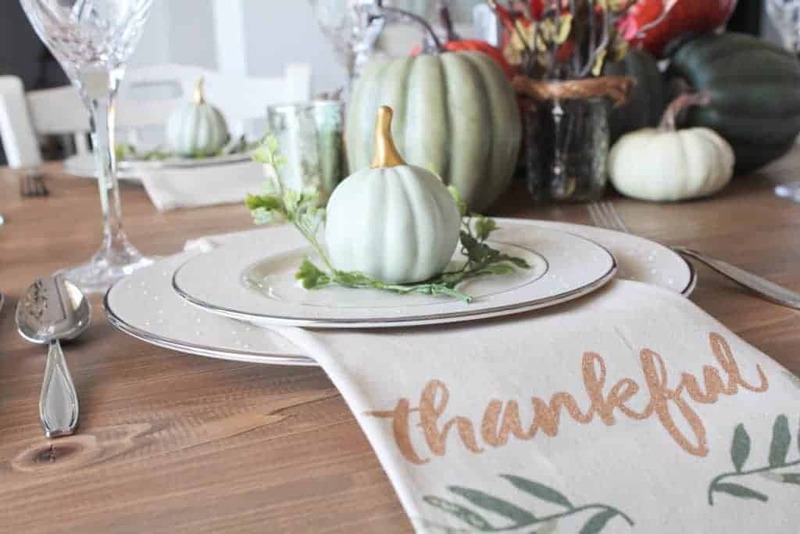 This is exactly what I’ve created and I want to show you how buying a few items from the Target dollar spot can really spruce up your fall centerpiece or table setting. First of all, I know a lot of you are thinking “this is great but my Target dollar spot never has anything.” Well guess what… I heard this week that you can buy from the Target dollar spot online! Yep, I’m not kidding. Happy Dance! Target is calling their dollar spot online the “Bullseye’s playground.” The only difference between shopping online and going to a store is that most of the items you purchase online have to be purchased in bundles. But, let’s be honest; who walks away with just one item from the target dollar spot anyway. You can click HERE on my affiliate link and it will take you directly to Target’s dollar spot. Note: this is an affiliate link and if you make a purchase from it I will receive a small commission, but you will in no way pay more for the product. Now that I’ve established that everyone, even my Canadian friends (for those of you who don’t know, there is no Target in Canada), can purchase Target dollar spot goodies online, we can proceed with the post. I love looking through other bloggers table settings. 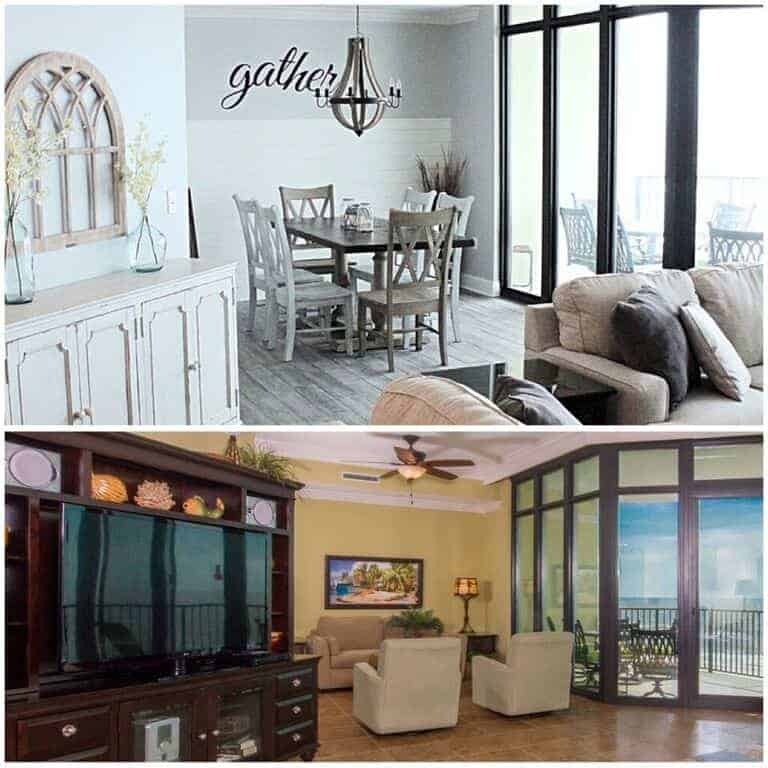 It seems everyone has a style, and I think my style trends towards simple and a bit rustic with farmhouse touches. They come in a pack of 2 for $3! I love the neutral colors of gold, green, and natural. Speaking of tea towels, check out my fall table scape from last year below. Those blue striped tea towels were also from the Target dollar spot last year. Back to this years table setting; Like I said it all started with those tea towels. They seemed to be one of the first “fall” things that rolled in at the beginning of the season. Next I found the larger pumpkins I used for the centerpiece and the “Harvest” sign. Note; the greenery came from Hobby Lobby from a few years ago. You’ll notice I use it a lot throughout my posts. Sorry, but not so sorry because I can’t justify paying for new greenery when I already had some from recent years, ya know?! The gold and green vase small candles also came from the Target dollar spot. My last Target dollar spot purchase was those cute ceramic pumpkins sitting on the plate. Best part about those little pumpkins, they were only $1! So what do you think about my Fall Table Setting from the Target Dollar Spot? 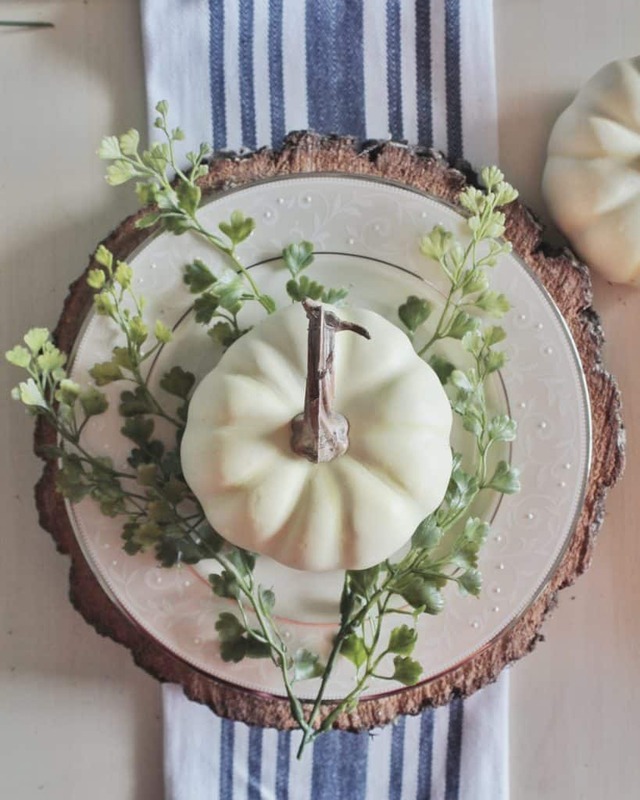 It doesn’t take a lot of money or creativity to create a pretty fall table setting. If your interested in how I created the dining room table and the story behind the base (errr casket carrier), click HERE. 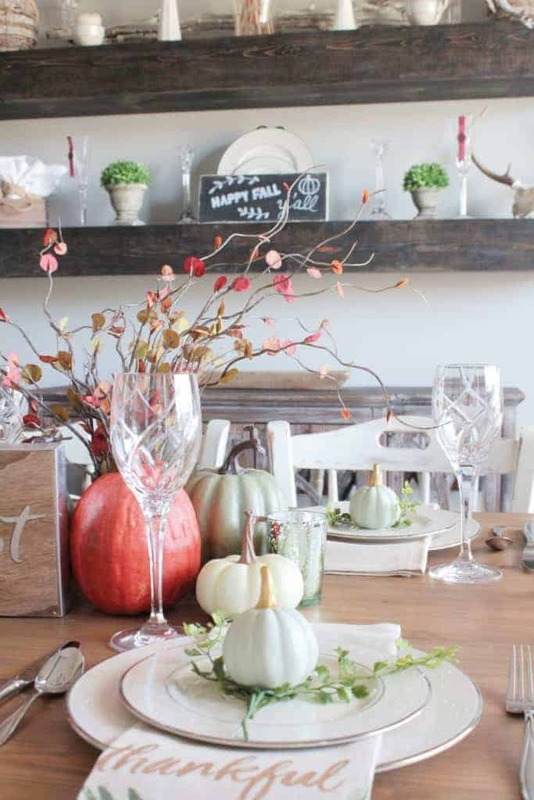 I hope this has inspired you to create your own fall table scape! If you enjoyed this post, I would love for you to Pin the image below to Pinterest! Or you can use the link HERE to take you straight to the Pin. As always, thanks for stopping by and don’t forget to peruse the lovely fall blog posts below on this Fall Festival Blog Tour! 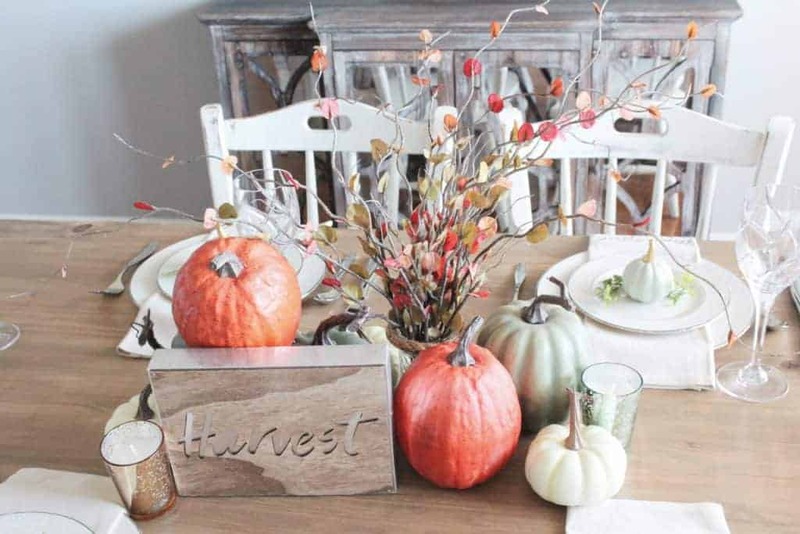 Next on the blog tour is Timeless Creations and her beautiful fall table scape. If you enjoyed this post I would love to know what you think about my other Seasonal posts! Warm and inviting and accessible! Happy to be on the tour with you! Love Target’s Dollar spot! Thanks for all the inspiration on how to create a beautiful tablescape without spending a lot of money. 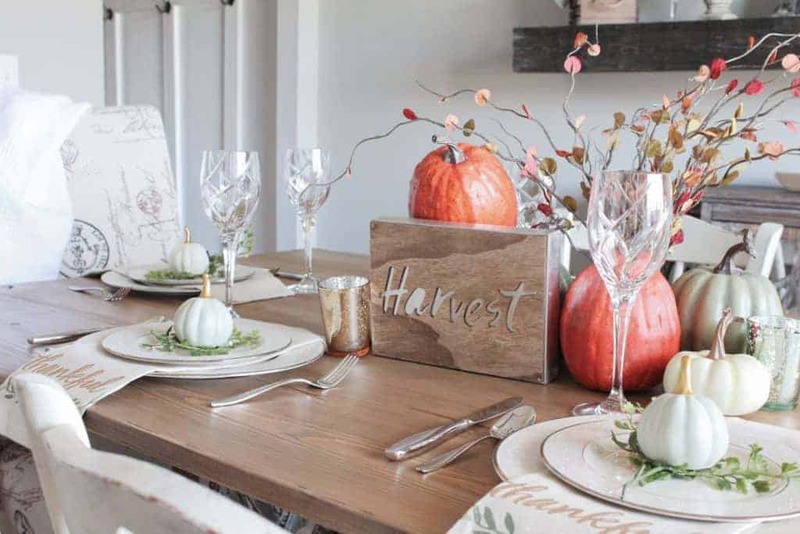 Your tablescape is just beautiful, and it its the perfect thing to welcome fall! love those Fall napkins! Great tablescape Lindsey! That Dollar Spot gets me every time! Your table is perfection! This is gorgeous, my friend! I love that you can create such a stunning table on a budget! 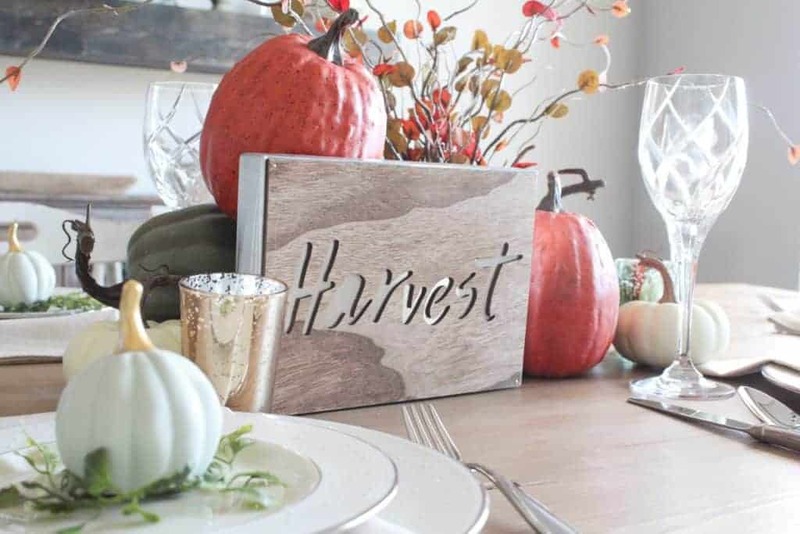 Your description of “Harvest” and “Gather” are the perfect introduction to this lovely tablescape that speaks of both. 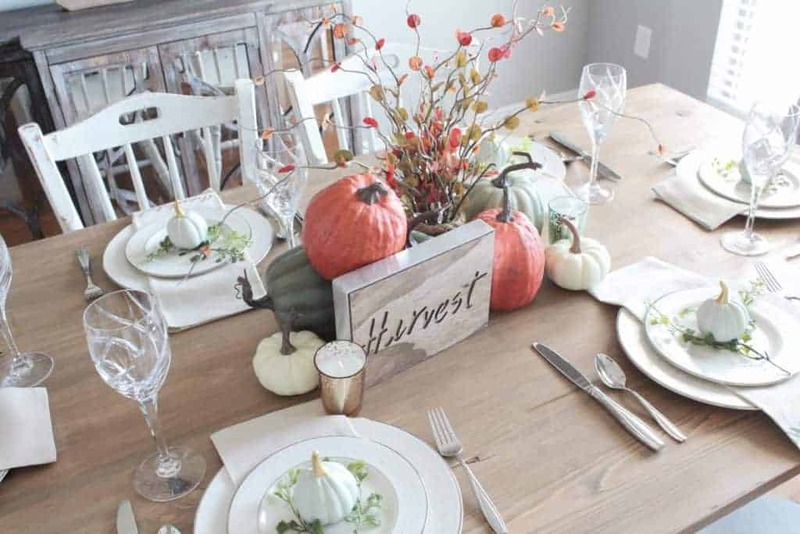 Your centerpiece is terrific in it’s rustic-ness and reflects a great “harvest” theme. Love the tea towels as napkins – so pretty and practical. Forgot to say thanks for the info about Target Dollar Spot being online now and even for us Canadians – will have to check that out! Your tablescape is beautiful, Lindsey! And I love it even more that it was created with dollar items! (And also, I’m a happy Canadian to hear that we can now order online- wow!) So glad to have you on this tour! Beautiful! Just love the Target dollar spot. I actually got some fabric pumpkins from there this year but wish I could have gotten the cream ones! They were all out! And I can’t find them online to buy either…darn. Nicely done! I love it! The whimsy centerpiece is my favorite and thank you for introducing me to the online dollar spot! You have officially blown our minds! Online from the Dollar Spot? One of us has moved to the country and this is music to our ears! 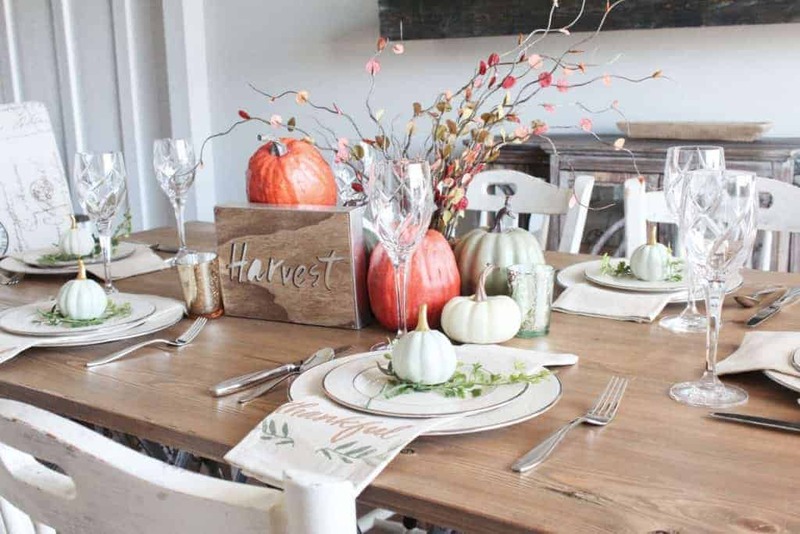 Your fall tablescape is absolutely beautiful. Love the tea towels and the mini ceramic pumpkins are perfection! So fun touring with you. Happy Fall! You created a beautiful table, and at a bargain price, too! Those little pumpkins are adorable, but I really love the tea towels! I had no idea about the Target dollar spot online, I will be checking that out before trying to hit up every Target in my area for enough of the items I am looking for! Great job! I had NO idea you could get Hot Spot stuff online! Since I live in Minnesota (Target headquarters), there’s a Target every 5 miles, but SO good to know for those that don’t have a Target nearby. 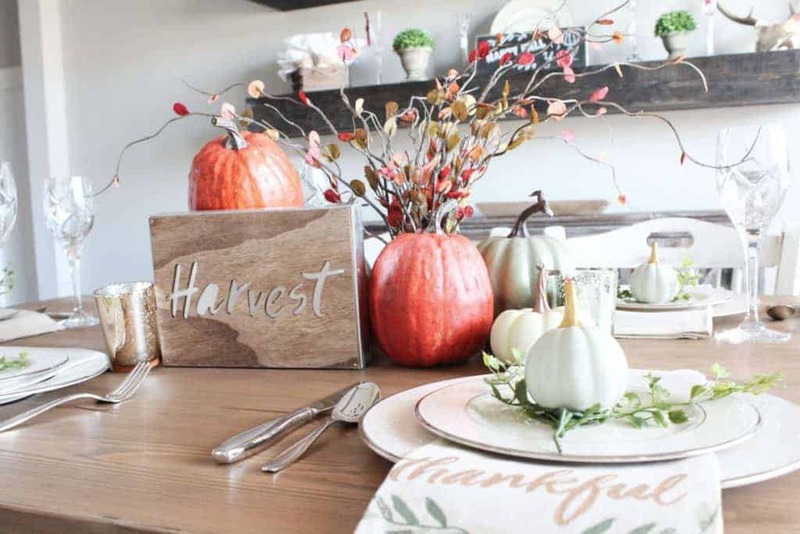 I love how you created this tablescape by using items you already had (and mixing in some new “budget-friendly” items). It turned out beautifully! I’m going to Target!!!!!!!! Happy Monday! This is very pretty! Thanks for the dollar spot tip!! This is beautiful!! So glad I found you via Grandma’s House link party!!! I love the Targer Dollar Spot — I recently moved, and my weekly Target runs are now few and far between…. Sad for me, great for my wallet! But, you better believe I’m going to be popping in soon! Last year, I found these apple pie recipe dish towels in mid-November one sale for $1 a piece!! I used those for my friendsgiving tablescape, and they were also the favor going home! Thank you! Your kindness means a lot! Gorgeous, classy table! I’ve been avoiding Target like the plague but it’s time i give in and see what I can find. Very pretty Fall table. I love that you were able to create such a lovely tablescape so inexpensively. I particularly like the little ceramic pumpkins you placed on the plates–can’t believe they are only $1. Thank you! Yes, those little pumpkins are a total steal! This is beautiful! 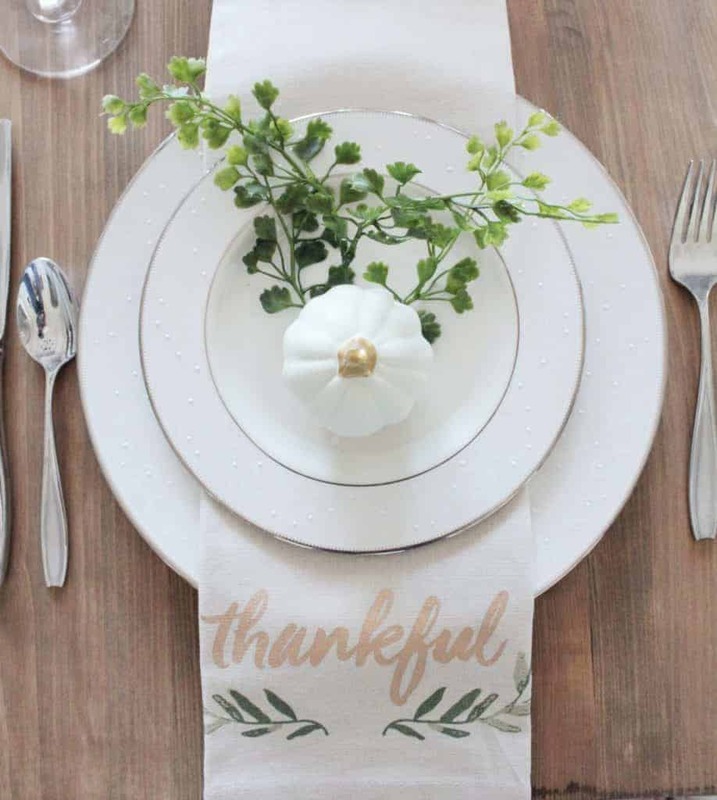 And just when I was wondering what to do for my Thanksgiving table setting when I host next (yikes!) month. I mean, I SUPPOSE I can force myself to go to Target or order from them online in order to be a good hostess. 😉 Thank you for this inspiration! Stopping by from the Blogger’s Pit Stop! OMG, Dollar spot items online is such a dangerous proposition! Love your tablescape. It’s the perfect blend of modern and rustic. Thanks so much for sharing at the #happynowlinkup! I really like your tablescape. Thanks for sharing something so pretty and cost effective. I love those tea towels and never would have thought to use them in this way! gorgeous table setting! I love the dollar spot at Target! Thank you so much Kathryn! Your lovely table setting is quite popular so the Blogger’s Pit Stop will feature it. Congratulations. Thank you so much Kathleen!! This made my night. This is sooo gorgeous, Lindsey! That Harvest sign is just wonderful. It really brings everything all together. 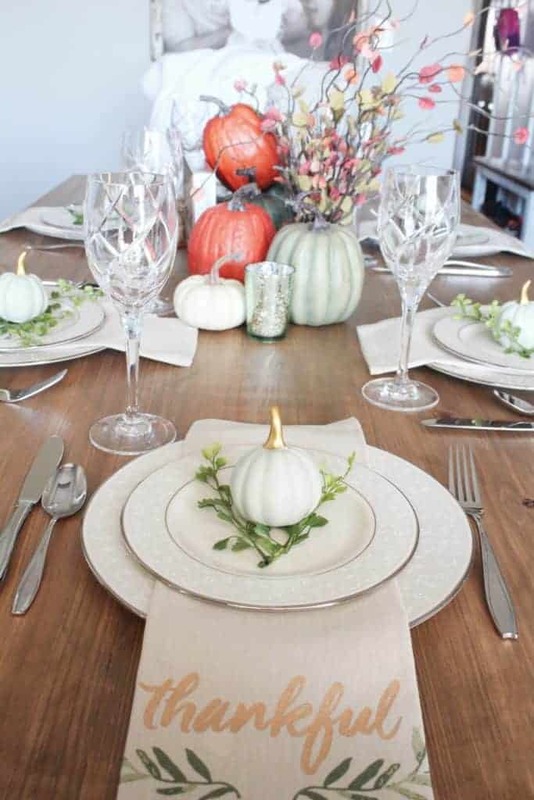 Your fall table setting is lovely! I’m often surprised at the items I find at the Target Dollar Spot. I found copper leaf napkin rings there that I’m using this year. It’s a great source. This was the Most Clicked post from our last Snickerdoodle Party and all of the co-hosts will be featuring it at today’s party and it’s included in our party reminded email. Hope to see you at the party! So glad to know can order online. Usually by time we can get to Target all the goodies are long gone. So many times by the time they have new things is at end of waiting time for our paydays, especially 5 weeks between, those are hard ones to stretch our money, we live on our SS and where we live is expensive. We live few miles west of Grand Junction so don’t run into town every day, maybe once a week if that. Several things I noticed on your table our Target didn’t have by time we went to Target. So glad you let us know we can order online now, hurray.